Who said the healthiest recipes have to be salad? 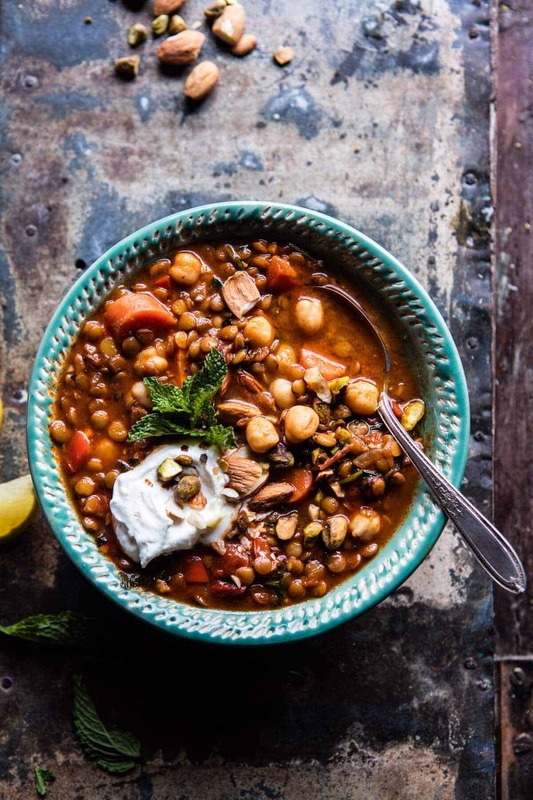 Crockpot Moroccan Lentil and Chickpea Soup from Half Baked Harvest on Vimeo. Because this soup is packed full of healthy ingredients, and YOU GUYS, this soup is, so, so good! Like it’s got to be in my top ten soups, but then I absolutely adore Moroccan flavors. They’re spicy, full of colorful veggies, and Moroccan foods like this one are usually topped with goat cheese…a major a yes in my book! In all seriousness though this soup is incredible and the very best part is that literally all of the ingredients get thrown into the crockpot and you are done. DONE! You’ll have soup slow cooking all day long, the house is going to small awesome, and dinner will be ready when you walk in the door. No browning meat, no making extra things when you arrive home, just ladle the soup into bowls and eat…and eat…couldn’t be better. This soup was inspired by many things, but the main reason is my brother’s girlfriend, Lyndsie. She traveled to Morocco last year and ever since then has been begging me to make a Moroccan inspired soup. Lynd’s is big on beans, veggies and all the spices they traditionally use in Morocco. I feel like Moroccan food has so much flavor and color, I love it. I also love all the incredible home goods Lyndsie brought back from Morocco. The next time she goes, I’m requesting a rug…or two, because they are some of the prettiest rugs I’ve ever seen. You can check out a few of the rugs they brought back here on her sister, Amber’s Interior Design site (click on rugs). Okok, so more than a few. What can I say, I really dig Moroccan flavors. Like I said, the color of the veggies and the spices they use are SO my kind of food. 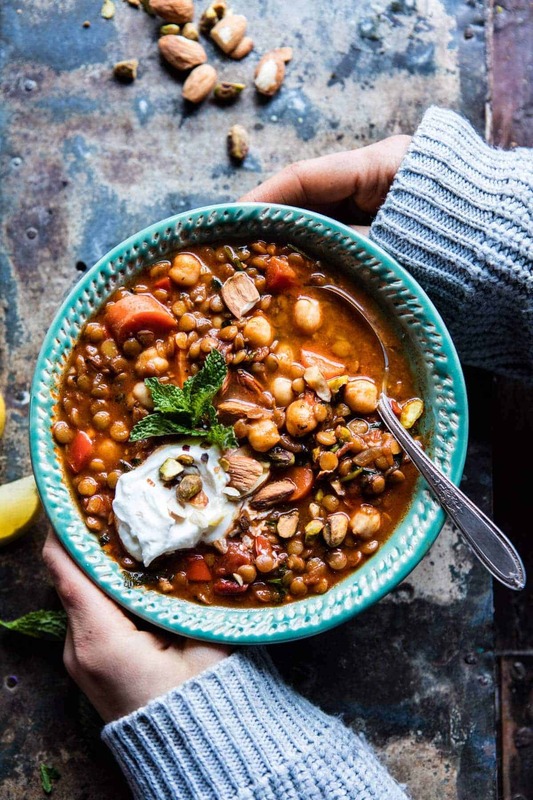 This soup is one of the more traditional Moroccan recipes I have made…or at least I think so. Meaning I did a little research before fully developing the recipe and learned that a few of my very favorite ingredients are used commonly in Moroccan cooking: cinnamon, cilantro, dates, chile peppers, bell peppers, lemons, and pistachios…literally all of my favorites, and I used all of them except dates in this recipe. See, can’t you tell this is going to be so good? I also added harissa for some serious flavor, lots of green lentils, chickpeas for protein, and carrots and bell peppers for some veggies. I then topped the soup off with a spoonful of whipped goat cheese, lots of fresh cilantro, mint and lemon juice, plus toasted almonds and pistachios. Oh, and then a side of, not pictured, naan, because at the time I took these photos, everyone had already eaten all of the naan I had made the day before. We are a naan obsessed family for sure! FYI, I made more for dinner that night. Can’t do soup without bread, and Moroccan inspired soup calls for bread in the form of naan. DUH. If the whipped goat cheese is feeling a little fancy for you (it’s just goat cheese beaten together with a little Greek yogurt until creamy), just top the soup with crumbled goat cheese or Greek yogurt. Either way you serve it up, it’s going to be GOOD. ps. this is also REALLY good served the next day wrapped up in naan with a little couscous (to help sock up the extra liquid), goat cheese and pistachios…oh and pomegranate arils. Got to love the leftovers! 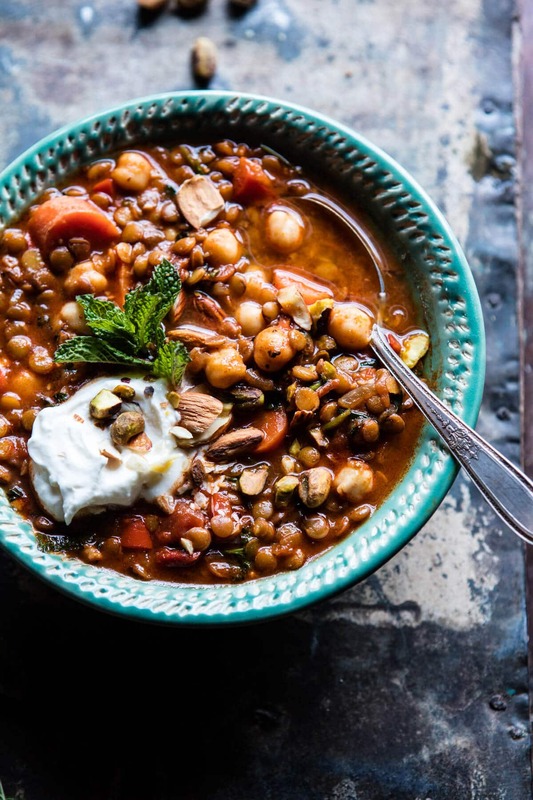 In the bowl of a crockpot, combine the lentils, onion, ginger, garlic, carrots, red pepper, tomatoes, veggie broth, 1/2 cup water, the harissa, paprika, cumin, cinnamon and a large pinch of both Kosher salt and pepper. Stir to combine. Cover and cook on low for 6-8 hours or on high for 4-6 hours. Just before serving, stir in the lemon juice, chickpeas, and cilantro, cook until heated through. If the soup is thick, add more water or broth to thin. Taste and adjust the salt to your liking. Ladle the soup into bowls and top with whipped goat cheese, almonds, and fresh cilantro. Eat! Happy Wednesday! Now let’s eat Moroccan soup! 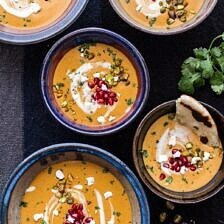 i mean anything with naan 😍 and i love the idea of adding goat cheese; it sounds like the perfect way to make it a little creamy and mellow out the soup a bit! This is AWESOME! I also love the beautiful colours and flavours of Moroccan food! What a coincidence, I’m cooking lentils for dinner tonight!!! I love a good soupy stew, really. so I’m making my curried lentils into a soup, it’ll be perfect! Can’t wait to try this.. you know my situation of having to substitute items on occasion. What can you suggest for green lentils?? Surprisingly I have everything else. Have Hubs on a diet now and I have leeway in the menu items and this would be perfect.. If noting can be used instead.. for their nutritional content I will wait until a trip into the cities. thanks. Have a great day. Still about 12″ old snow still all over. Hi! Try doubling the chickpeas, I think that will be great! Ok I have all the ingredients so I think I need to try this ! I too love the deep spice of Moroccan food. Yes please to this crazy protein packed meal. 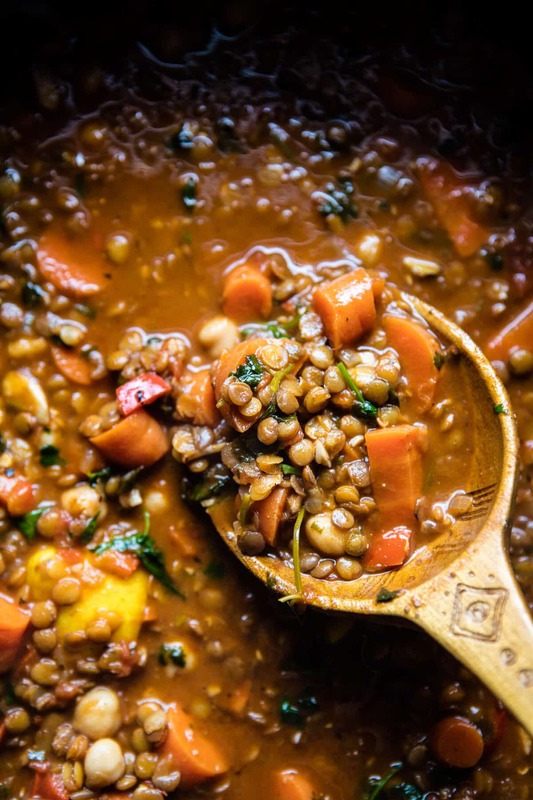 Love lentil soup – will try this tomorrow! Thanks! I feel like I can already smell this just by looking at the pictures! Looks delicious! Do you think if I had dried chickpeas, I could just add them to the crockpot at the beginning with everything else? Thanks! Hi Mandi! I think adding dry chickpeas will work great. I would add a cup of water. Let me know if you have questions. Thanks! LOVE harissa! I can’t wait to try this! Yes, yes, yes! You are killing it with the flavorful and easy veggie dinners. I LOVE IT!!!!!!! These photos are gorgeous, Tieghan! I love the first one, it is so cozy 🙂 Love all of this! I’d say about 2 quarts. I was so craving soup for dinner and this is perfect!! Hehe, it’s just that time of the year. Thanks! Healthy food without salad exists! The weather here is cold and I will not resist this Moroccan soup. Only one of those beautiful carpets is missing. I have something in the slow cooker like this right now! Yum! Anything with lentils and chickpeas is always welcome in my house! I LOVE healthy recipes that are not salads. And putting all the ingredients in the crockpot to cook all day? Bonus! Definitely adding this to my recipe rotation next week. Thanks Jessie! So happy you are enjoying the healthy recipes! The instructions mention two cups of water, which is not included in the list of ingredients. Are these in addition to the vegetable broth? This looks amazing! wondering if it’s possible to do a soup version and not have to cook it for so long? I don’t have a crock pot but I do have a hot plate – the thought of leaving it on all day worries me! What do you think? Could I make it in a couple hours instead? Thanks so much! Hi! So I would recommend just simmering this on the stover for about and hour over medium low heat. I think that will be great. Let me know if you have questions. Thanks! Tieghan, I have to say I really like your blog. It’s about your recipes, but that’s not all. I think your enthusiasm, and honest approach shine through and make it a real treat to read. Thanks for sharing! Florida winter-ey weather is here and this soup hits the spot! It was easy to put together, smells great, and tastes even better! I took a shortcut by subbing the harissa for siracha and added some spinach. This is great and I will definitely be making it again! Awh yes, sounds perfect! So happy you liked it, thank you Megan! I just made this and it was such a hit with my picky husband! So yummy! Thank you, you’re awesome! Always love hearing this!! So happy you two liked them, thank you Casey! I really look forward to the creative recipes and gorgeous pictures in your blog! 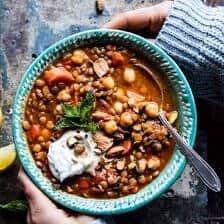 The Moroccan lentil and chickpea soup turned out to be delicious and filled my house with the most intoxicating aroma. The only problem is the lentils never softened. I carefully followed the recipe and cooked it in the Crockpot for far longer than 8 hours, but the consistency of the lentils never changed. What did I do wrong? Thank you , and keep up the good work! Hi Emerson! Thank you so much for the kind words. I am so happy you enjoy my site! That is SO weird about the lentils. I can’t believe they where hard after all that cooking time. So weird. Next time, try soaking the lentils in water overnight, then drain off the water and cooked as directed. That really should make sure they are soft. So sorry for the trouble!! I made this today, love! It’s so versatile. I threw in some preserved lemon and Swiss chard. Love North African food, keep the recipes coming! I also recommend Morocco for the family vacation, obviously great food and terrific people. That sounds amazing! So happy you liked it! Morocco sounds like such a fun place! Awesome! Didn’t have garbanzos so used black beans and added baby kale. Hubby growled about no meat then had seconds! It is a really hearty soup. I used some Greek yogurt instead of the goat cheese. Sounds amazing!! So happy you like it! I made this with the 2 cups of water and 4 cups veggie stock and it came out so watery. I wish I had added less. What went wrong? HI! It sounds like your crockpot really trapped in the moisture. I would just omit the water next time. So sorry for the trouble, hope you enjoy the flavors! Let me know if you have questions. Thank you! I was so excited to make this soup that I even went out and bought a new crockpot but it was very disappointing. I cooked it for 7 hours but it was watery and flavorless. I finally puréed it with an immersion blender, added more cumin and some curry powder but my husband said don’t bother saving the leftovers. I followed the directions to the letter and just don’t know what went wrong. I have made homemade soups and stews for 40 years and never had such a failure. Just plain bland. And it looks so damn good in the photo! HI Patti, I am really sorry you are un happy with the recipe. I am not sure what happened since I don’t know exactly what you did. I guess some recipes just are not for everyone. Again, sorry for the trouble. Made this last night and it was great! Just the right about of warmth and great flavor! Thanks so much for this recipe! I am so happy to hear that it went perfect for you, Meg! Thank you so much!! I am making this soup right now.. only thing I don’t have is the harissa.. does it make a big difference? Can I sub with something else.. it’s already cooking 3 hours.. can I add 1/2 way through the cooking… doing the slow method. Made this and it was FANTASTIC. Also super cheap. Love that. Always a perk (: Thanks Sierra! This is fantastic! Used garam masala and berbere seasoning… did not have harissa on hand but these spices worked great. Topped with goat cheese and pistachios. The fresh cilantro is a must and so is the naan! A really great recipe. So glad that worked! Naan is always A must for my family and I! Thanks for making this Steff! Meatless Mondays are great! So happy this one made it! Thanks Jen! This is amazing, love soups like this. Very nutrition and you put so many flavours, thank you for this recipe!!! Awh, thanks so much Maria! Hope you love it! What type of nuts should be used as the topping? I love using pistachios and almonds. hope you love this! Yogurt sounds perfect! So happy you liked it Kerry, thanks! I will not resist this Moroccan soup. Thanks for sharing. Hope you love it (: thank you! I’m thinking of braising short ribs or lamb shanks with this. Any suggestions on what i should add/substract/modify in the recipe to accommodate? Hi! I think adding about 4-5 pounds of short ribs will be great. Reduce the lentils to about 2/3 cups. Let me know if you have questions. Thanks! When adding the canned chickpeas do you include the liquid in the can or should they be drained? This was great, but the nuts were not in the ingredient list, so I did not get them while shopping. Oops sorry about that Mary Anne! Really glad it still turned out great for you! Wow! Seeing the pictures in the article, it looks delicious! I think i’ve got hungry! I feel like to try this soup. You totally should! I hope you love it! Thank you! I made it here, it was delicious. Tieghan, this soup was delicious! It’s been too long since I’ve made your recipes but I’m rediscovering some yummy ones that I had bookmarked. Woops! I forgot to mention, in all fairness, I need to say that I ignored the “slow-cooker” aspect of the recipe and just made it like a regular soup on the stovetop. The flavors were still on point! 😉 I’d make this again for sure! Can’t wait to try this! If I wanted to make ahead to freeze, are there any modifications I should follow? Has anyone done this with dry chickpeas? Maybe just soak them the night before and add extra water, putting them in at the very start along with the lentils? soups ♥, needed a content like this, gratitude! Glad you found this! Thanks Elisa! Use 2 teaspoons crushed red pepper flakes. Let me know if you have questions. Hope you love this! This turned out really well! I sautéed the onions in a little olive oil first and added in the spices, before dumping it into the crockpot. Really easy and I packaged it up into 4 containers to take for lunch all week. Such a great meal prep! Thanks Sabrina! Sounds delicious and can’t wait to try! Do you think it would freeze/reheat well? Hi Kelly! Yes, this freezes perfectly! Let me know if you have other questions. Hope you love the recipe! Thank you! Why do recipes that start out with “healthiest” never include calories and nutritional information? Hey! I go by how healthy and nutrient dense the ingredients are. 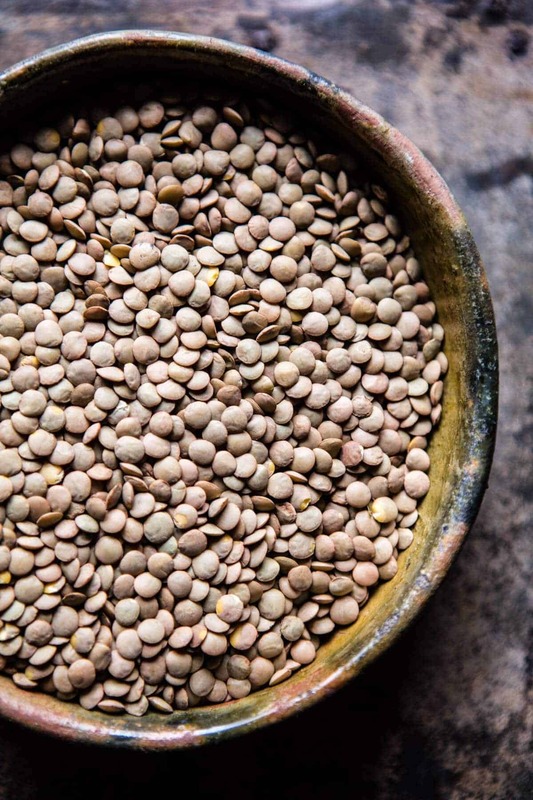 Like for this recipe, lentils are high in protein and super good for our heart. Instead of worrying about calories or fat content, I try to focus my recipes on the nutrients we can receive from them. I hope this helps, let me know if you have any other questions! If you do still want to find out the nutritional information, you can put the ingredients in an online calculator and divid by the number of servings. 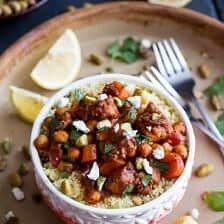 In anticipation of travelling to Morocco in a couple of months, I was looking for a recipe to try. Not only did I LOVE this recipe but I stirred a little into some rice to serve along with our chicken for dinner. My husband thought it smucked with flavour. Very tasty. I pinned it to my favourites! I am so glad you loved this Kathryn! Thank you so much! My boyfriend has been asking for this recipe almost every day since the first time it hit a degree under 75 degrees in Nashville. We call it Moroccan “chili” since it’s so hearty. I finally gave in and made it today (it’s technically 75 here today, but it’s October dangit!). I am so glad I did and this time didn’t forget the naan. It’s one of our favorites! Thanks! I am so happy you and your boyfriend loved this Aly! Thank you! Wow, this was delicious! 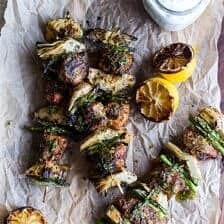 My first recipe from your site and I’m checking out others that look good to try soon. The secret ingredient is definitely the whipped goat cheese … oh my gosh. I do love my goat cheese so this was the kicker. I added a bag of greens to the soup when I tossed in the chickpeas because I love my greens and they went superbly with this dish, a great add-in. Thank you Tieghan! I’m glad I discovered your site. That is amazing! I am so glad you liked this soup Jerri! I think my favorite part is the whipped goat cheese.. so yum! Thanks! This soup sounds marvelous……Just wondering if there is any other fresh herb that I could sub for cilantro? That is so amazing! Thank you Haley! I made this today in my Instant Pot and it came out great! (I used the Soup setting, which cooks it for 4 hours.) I didn’t have any chickpeas, and since it was 3 degrees for a high here today, I substituted the white beans I had in my pantry. It is very hearty and I will definitely make it again. I am so happy to hear that! Thank you Dawn! I was wondering if I can make this without a crockpot and how you’d suggest to adapt the recipe? This soup is amazing as is but if I were to add link sausage to it how would you suggest doing so? Thank you so much! This was delicious! The only lentils I had in the cupboard were Belugas but they worked just fine. Made the kitchen smell wonderful on below zero day. I will make this again. Have you ever frozen this soup? If so, how’d it turn out? I am really into my crockpot right now and it was just a little rainy today in Southern California so this looked cozy and easy. It did not disappoint, great flavors and so YUMMY, my family loved it topped with the creamy whipped goat cheese. On a side note, next I am going to try one of your recipes with pomegranates which I grew up eating here in California and love to eat raw. You are very creative and talented, so don’t let that “negative pomegranate person” tell you any differently! Thank you so much Robin! I hope you love the recipes with pomegranates! Hi Tieghan! This looks great. Any suggestions on how to modify this to an instant pot recipe? PS: I have been following your blog for a few years now . I have made and loved many of your recipes! Saw your cookbook in a store recently and wanted to congratulate you on your amazing progress and hard work! You are awesome! I love this recipe! it is so easy and the soup is extremely satisfying – thank you for sharing. Thank you Dee! I am so glad you like this! My slow cooker broke and I’ve used my instant pot as a slow cooker but it’s not quite the same. Do you know how I should convert this to an instant pot recipe? Loved the exotic aroma that resulted as it comes through the day! It matched the delicious results. The lemon juice really brightens the flavor and off sets the richness of the goat cheese. Thank you so much Jim, I am so glad you enjoyed this! Just wanted to say I really love this recipe, thank you! I don’t have harissa so I use gochujang, a Korean fermented chile paste. It seems to work! Great! I am so glad you liked this Natalie! This soup is DE-LISH! I just finished making it. I’ve got enough for lunch for the week. I wound up doubling the recipe so I have loads of it. Thanks again! Hi Mildred! The lentils I used were dried, but the chickpeas were from a can! I hope you love this! I made this recipe this morning before work – so easy just to chop everything up and add it to the pot! I left it on low all day although I stirred it at lunchtime. So it had probably been in for something like 10 hours. It was absolutely delicious! And so healthy because we didn’t have any cheese, just some harissa flatbread. I will definitely be making this again. I am about to try the honey strawberry muffins . . . . I am so glad you loved this Liz! Thank you! I hope the muffins turn out amazing for you! I made this delicious soup on the stove instead of crockpot and loved it. Found the Harissa paste at my local Kroger. Hi! Love your blog Tieghan. I have some pre-steamed lentils that I need to use up. 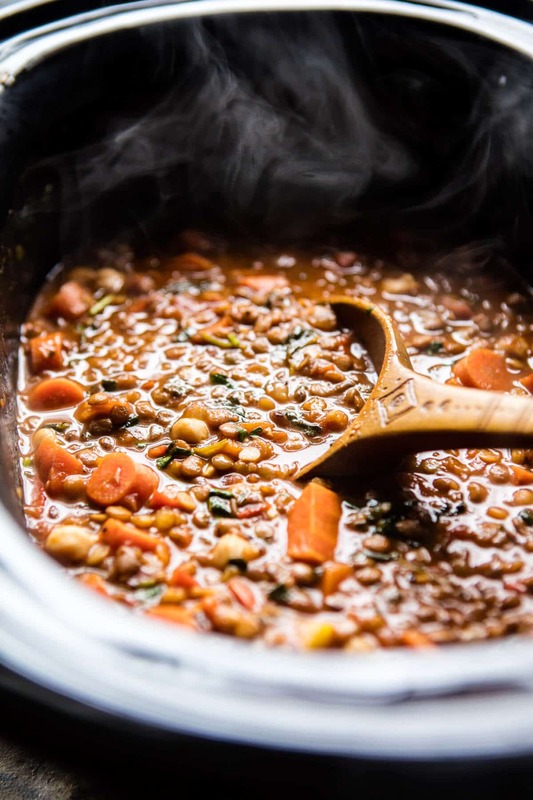 If I’m making this stew, when should I add in the pre-cooked lentils? With the chickpeas, or before? Did you use harrisa powder or the paste type? Hi Mary Jane! Yes, the nuts are used as a topping along with the cilantro and whipped goat cheese! I hope you try this! How big is you’re crockpot? Mine is 3 liters.. I wonder how much should I scale down the amount of ingredients 🙂 thanks! Recipe looks great. I wish I could get the ten minutes of my life back it took to read your personal story. Who cares? Can you give directions on how to make this yummy sounding soup using an Instapot please? I now use only dried beans since buying my Instapot, and the difference in taste is astounding. Thank you! hey have you considered adding to the ingredient list the other ingredients that you mention? — the 1/2 cup water and the nuts? Thank you for this amazing recipe! I’m going to try it out tonight and I was wondering if I could subsitute the green lentils with red split lentils? I already have them in my pantry. Would I need to put them in the recipe a bit later or do they cook the same as green lentils? Thank you! This was super delicious! Just enough spicy and the goat cheese was an amazing addition. Thanks for all your awesome recipes! Hi Heidi! I am so glad you enjoyed this soup! Thank you so much! This sounds so delicious and going by all the comments, it must be a good recipe (except for those exceptions, that probably either did something wrong or had wonky ingredients). My question is what can I do about whipped goat cheese? It’s not available where I live in Edmonton, Canada. Can I make some myself? If so, what would the best process be? Made this for dinner just as directed. We have not eaten many things with this particular spice family in it, but this was really yummy. My eleven-year-old has eaten the leftovers almost single-handedly! Very good exactly as written. Pistachios aren’t listed in the ingredients list but I see them in the picture and then saw them mentioned in the description. Do you toast these as well? PS I was directed by a friend who made this for a luncheon and begged her for the recipe. She didnt have any nuts on top and it was still delish. With the nutty adjuvant I can only imagine it to be absolutely scrummy! I dont see cilantro in the pictured finished photo but mint instead…I guess either would work? Hi Tieghan! Do you think a salty crumbly feta would garnish this soup nicely? I don’t have goat cheese on hand, but I’m not sure if that will create the same creamy, tangy flavour goat cheese would. This looks delish, can’t wait until its ready! Yes! I am sure it would taste amazing in this! Thank you so much Fay! An excellent tasty dish and a hearty meal. I’m about to make this recipe and I’m really tempted to saute the veggies and aromatics before adding the liquid and setting the crockpot (instant pot in my case). Thoughts? Is this recipe also possible without a crockpot? This looks super yummy and I’ll definitely try it soon. Wondering why you say to cook so long in the crockpot? I’d understand if the chickpeas were dry, but the recipe calls for canned. I have some ras el-hanut in my spice cabinet, think I’ll add some too. Thank you for this interesting recipe. Not normally a crockpot meal fan, but this was TOP NOTCH! I actually served it for a dinner party and received compliments all around! Flavors are delicious and no mushy texture to be found. And it was sooooo easy. Definitely becoming part of my regular rotation! 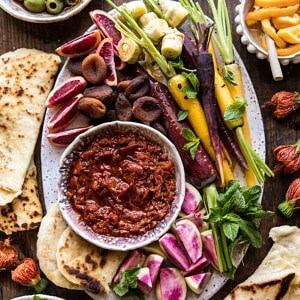 The harissa, is the powder or the paste used in the recipe? Made this for company and it was a big hit! I don’t like too much hot spice, so instead of the harissa, I just used the harissa spices of toasted ground cumin, coriander and caraway, a pinch of saffron, turmeric and black pepper, a tablespoon tomato paste, and a dash of cayenne. Instead of the crock pot, I made it in the pressure cooker, carmelized the onions first, added a half chopped preserved lemon instead of the lemon juice, and at the end added a dash of liquid smoke. Fantastic dish, thank your for the inspiration! I made this in the instant pot and omg it’s so amazing! Can’t wait to make this again in the fall!